High quality construct: handmade craftsmanship. Tough and durable leather. Rounded edges to easily insert in pocket. Superior double stitching detail holds the gussets and various pockets firmly together. Beautiful satin fabric lining. Functional design: luggage id card slides in between leather gusset with buckle strap looping around the opening to secure the id card. Plastic cover over the id card to protect it from outside conditions. 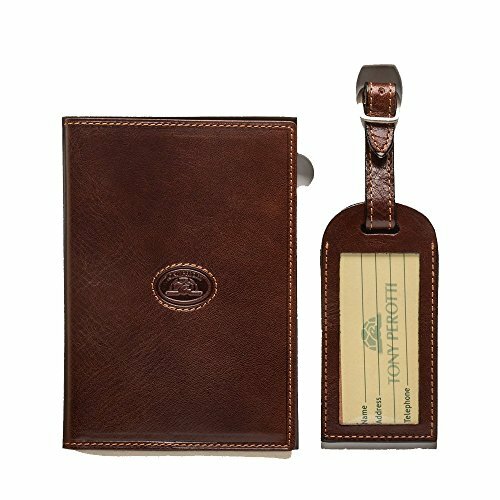 Handcrafted with top notch stitching make this luggage tag an elegantly simple way to distinguish your baggage. It can undergo any long distance trip by land and by air to make sure it can survive any demanding traveling environment. Perfect luggage accessory for high end luggage brands. Organization & features: this passport case holder and luggage tag combo gift set features a clear plastic film to insert passport, three large pocket slots for credit cards, boarding pass or plane tickets, and other important paperwork. Luggage tag has a gusset insert with plastic window and has a buckle closure to securely fasten on any briefcase/suitcase. Dimensions: passport holder: 5.5"(l) x 3.75"(h) x 0.25"(w). Weight: 0.11lbs. Luggage tag: 4"(l) x 2"(w). Weight 0.03lbs. Satisfaction guarantee: this product is backed by a 100 percentage customer satisfaction guarantee and comes with a limited lifetime warranty which covers hardware parts, malfunction defects and replacement for the life of the product. It does not cover normal wear and tear issues, stains, holes, or mistreatment. Disclaimer: the leather on our products is hand dyed and the characteristics, marks and color of the surface of the leather may vary from the pictures shown. Functional design: bills will fit neatly into the currency gusset. 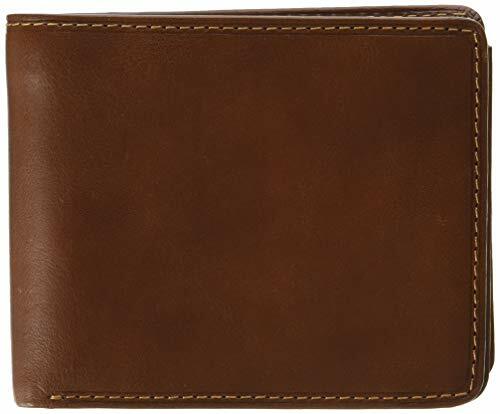 This wallet has rounded edges, making it easy and convenient to insert in your front or back pocket. Receipt pockets come in handy to organize and store receipts, notes, additional cash and cards, and other essentials. Coin pocket has a snap on fold over closure with an expandable pocket which ensures your coins will not fall out. Stainless steel spring tension clip retains its form and tightly secures bills. 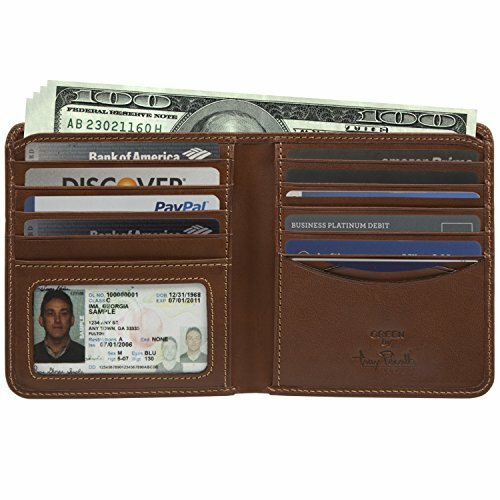 Organization & features: this classic bi-fold multi credit card wallet is a remake of the standard bi-fold, designed with multiple credit card slots yet surprisingly slim and sleek. Can hold up to seventeen credit cards. Features a middle fold that can carry a total of eight cards, double currency divider, and rounded edges for ease. Comes in signature tony perotti gift box. Dimensions: 4.5"(l) x 3.75"(h) x 1"(w). Weight: 0.70lbs. PERSONALIZED CUSTOM NAME INITIALS EMBOSSING ENGRAVING: This is the perfect gift idea for a loved one as a birthday, graduation, wedding, anniversary, or holiday present. Embossing Info: We only use capital letters. Aluminum die letters are heated and pressed onto the leather to blind emboss the initials. Please do not use any special characters. English alphabet only. Item non-returnable unless specified by special condition. For more information please send us a message on Amazon. Made from Full Grain Italian Cow Hide Leather. Vegetable tanned for greater durability, texture and feel. Leather is soft to the touch with a matted grain finish. Front exterior features one zippered compartment and an open compartment underneath flap. Rear features an open compartment and double zippered pocket. Top easy to grasp padded handle. Features lockable T-clasp closure with key inside. Comes with 1" thick detachable and adjustable padded shoulder strap. Comes in signature Tony Perotti lint bag for storage. Interior pigskin lining. 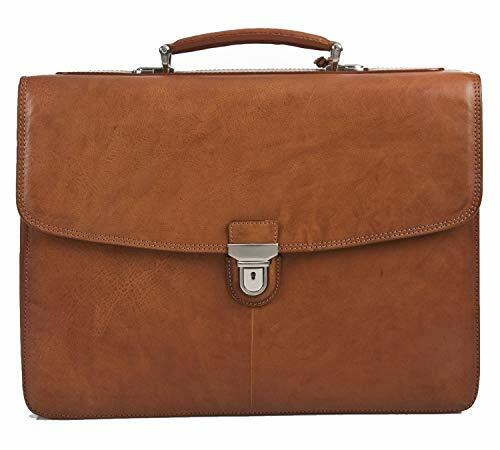 *100% GENUINE LEATHER MADE IN ITALY: Full Grain Italian Cow Hide Leather. Vegetable tanned for greater durability, texture and feel. Leather is soft to the touch with a matted grain finish. Develops a beautiful patina over time. *HIGH QUALITY MATERIAL: Superior Handmade Craftsmanship. Tough and durable leather. Burnished smooth rounded edges. Sturdy double stitching quality holds the compartments and various pockets firmly together. Luxurious interior satin fabric lining. 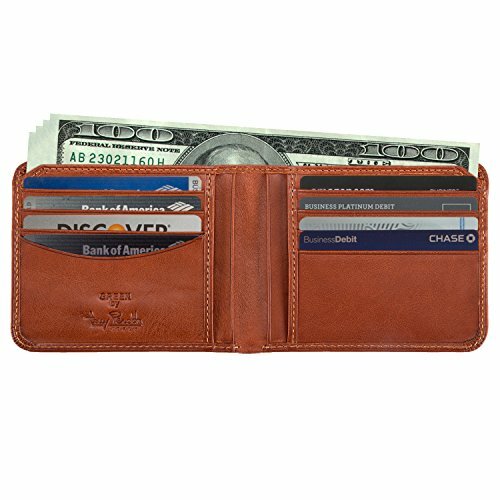 *FEATURES: This thin and sleek classic bifold is a simple yet elegantly functional minimalistic wallet with high storage capacity that features a total of 9 credit card inserts, 4 auxiliary receipt pockets and a double currency divider gusset. *STYLISH MINIMALISTIC DESIGN: Classic two fold wallet that has all of the components to carry your day to day essentials while remaining thin and lightweight. Offers great comfort and security for travel. *SATISFACTION GUARANTEE: This product is backed by a 100% Customer Satisfaction Guarantee and comes with a Limited Lifetime Warranty which covers hardware parts and malfunction defects for the life of the product. Made from Full Grain Italian Bull Hide Leather. Vegetable tanned for greater durability, texture and feel. Leather is smooth to the touch with a shiny glossed finish. Laptop Compatible up to 17". Interior front compartment is zip around, features three(3) business and credit card holders, three(3) pen holders, one(1) stationary pocket and one(1) zippered pocket. Middle compartments features zippered compartment, mesh pocket, top open for easy access. 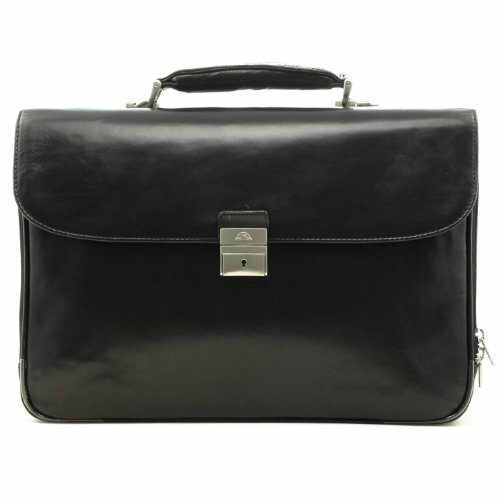 Rear compartment designed for laptops or tablets, with extra zippered compartment. Flap Over closure, Square Lockable Clasp (with key). Top padded easy to grasp handle. Interior plaid lining. Comes with 0.75" thick detachable and adjustable shoulder strap. Comes in signature Tony Perotti lint bag for storage. Dimensions: 17"(L) x 12"(H) x 6"(W). Available Colors: Black, Brown. Comes with Limited Lifetime Warranty. HIGH CAPACITY: Broadly spacious yet thin and lightweight, this wide bi fold offers the best organization to keep all of your cards safely secured and protected while giving you easy access to them. Comfort carry fits perfectly snug in most standard pant pockets!